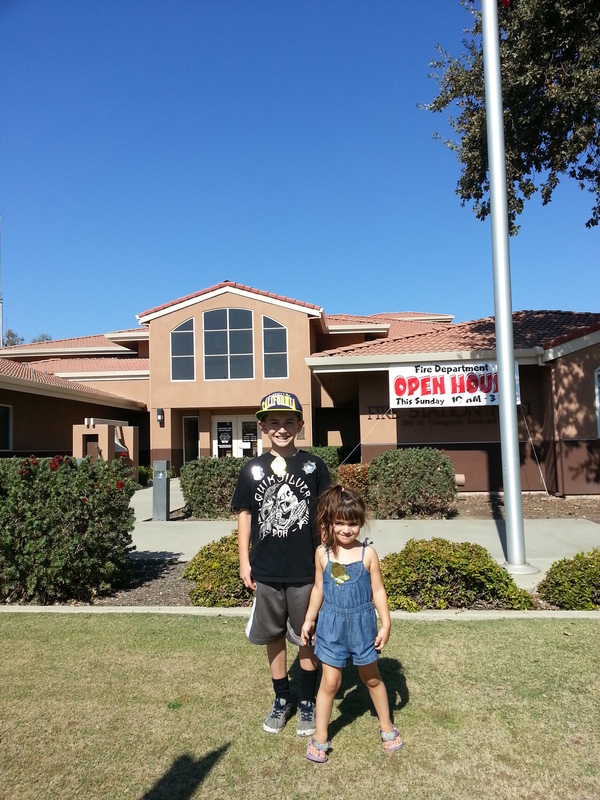 Every year our local Hanford, Fire Station has an open house. Usually we aren’t able to make it, because it’s the same weekend we make our trip to Roseville to visit my Dad and head out to Apple Hill . Because we were not able to go up North this year, I excited to take the kids to this event. Growing up my Dad would take my brother and I to things like this. I love to pass the experiences down to my kids. Emery has really been asking questions about Fire trucks and Ambulances. Any time we see one on the road we talk about where they might be headed or what the kind of things the vehicle has inside of it. 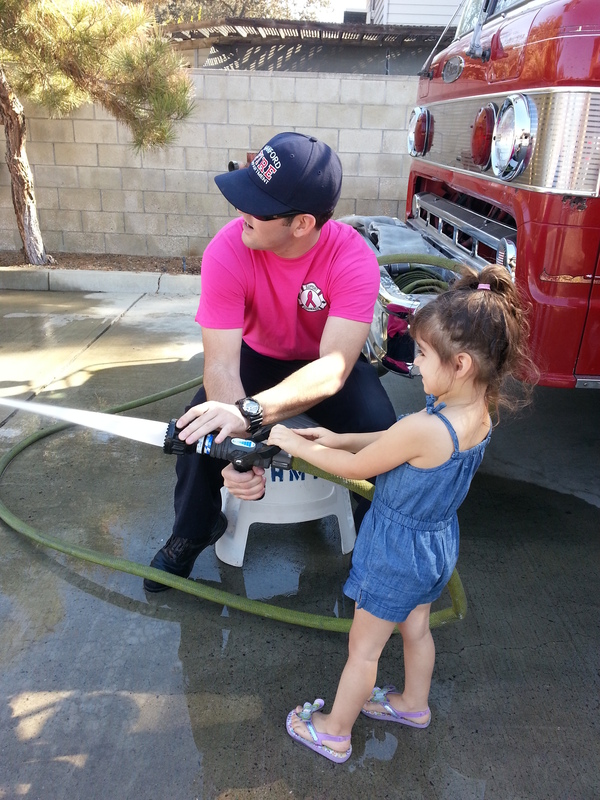 The Hanford Fire Station’s open house is really a hands on experience. With guidance the kids are able to work the fire hose and put out a “fire” (a red vinyl sheet) in the window. How often does a person get to say they’ve done that! There’s an Ambulance the kids can go in and a Paramedic will talk to the kids about what the different things inside are and used for. Even I learn about a machine that can take a picture of your heart. Pretty cool stuff. 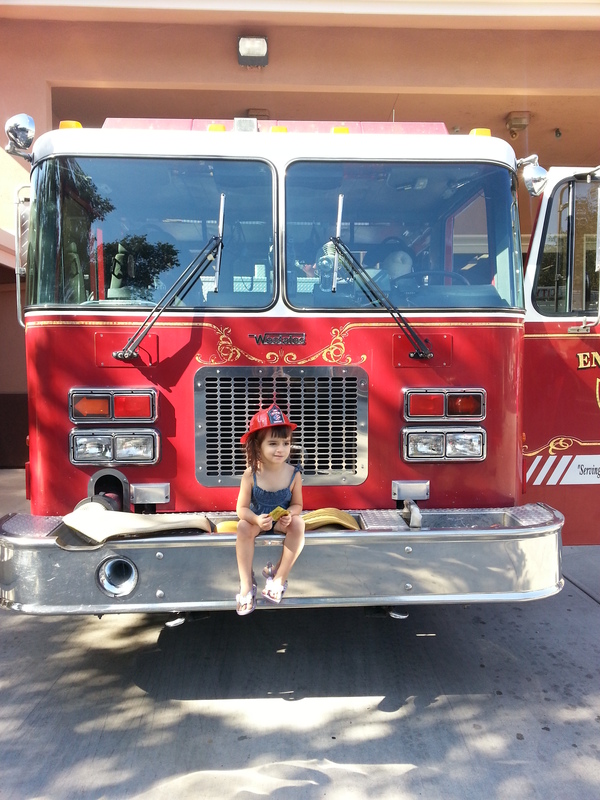 Emery sat in the front seat of a Highway Patrol car, and sat in the Fire Truck’s front and back row. 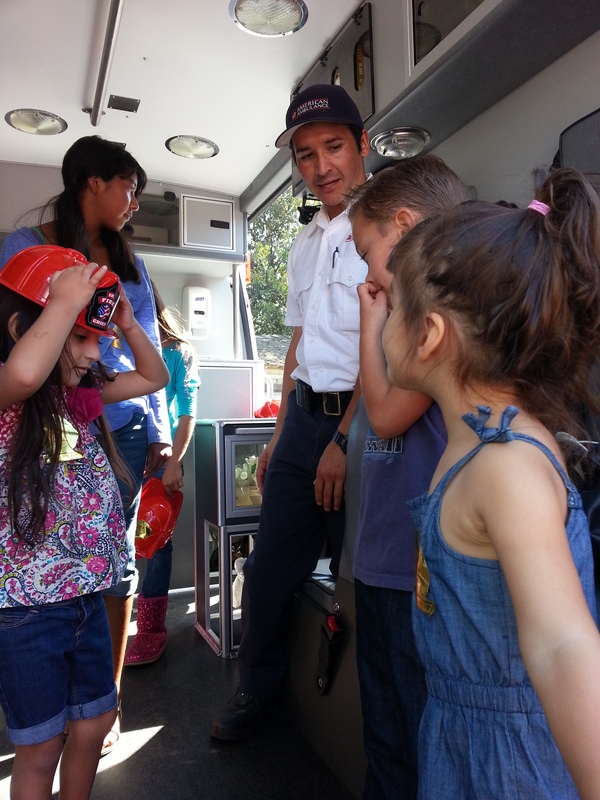 The Fire Fighter’s handed out goodie bags with pencils, magnets stickers and fire safety coloring books. This year the Fire Station also had, Kid Print. 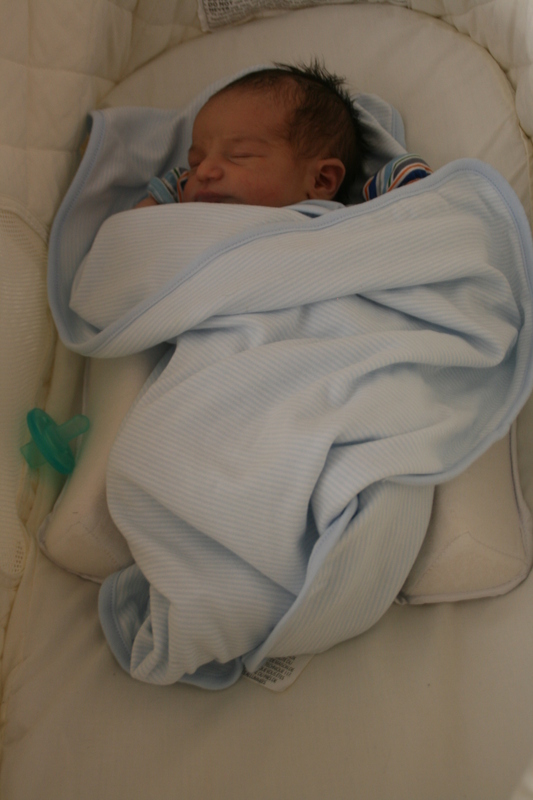 It’s a card with your child’s home address, measurements, photo, thumb print and any birth marks or allergies that he or she may have. The information is then added to the Police Stations data base on record. It was free and totally worth waiting in line for. I’m going to put my daughter’s card in her backpack she carries around. After we got our card we took a little tour into the Fire Station to experience how a Fire Fighter lives. We saw their living room, kitchen, rooms and gym. Last but not least we had to ride, “Freddie” a little red tour truck, you can see around town from now and now. 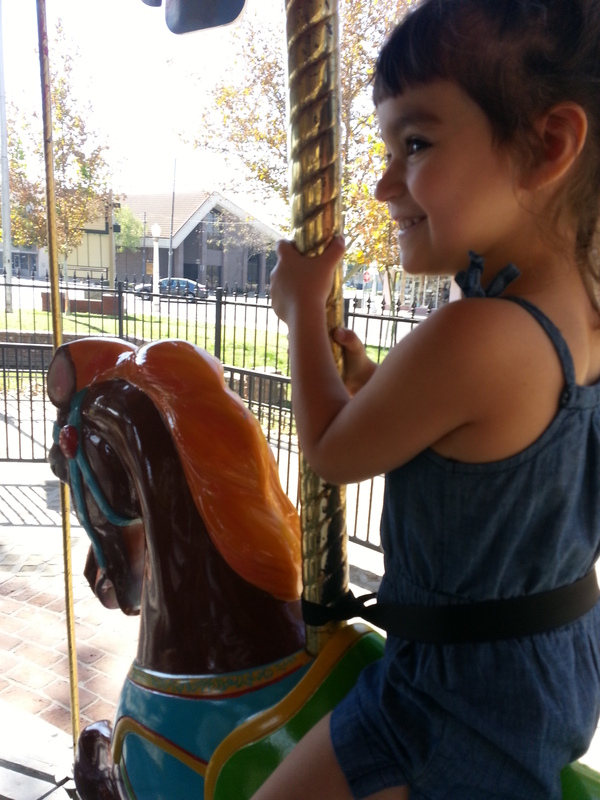 Freddie took us all through down town and dropped us off at the Carousel. We had no idea we would be getting dropped off. It was a nice little surprise. Despite all the amazing pictures and the fun I know the kids had, for me this was the best part Because, every time I drive down town Emery will always ask and talk about the one time last year she got to ride the carousel. I feel bad that I we don’t stop, but I never see anyone on them or a man standing at the machine waiting for riders. So this was THE PERFECT way to end our day. She was so happy! She was laughing and yelling. A lady in front of us kept turning around because Emery was so happy. Pure happiness from a child is the best thing on Earth for me. 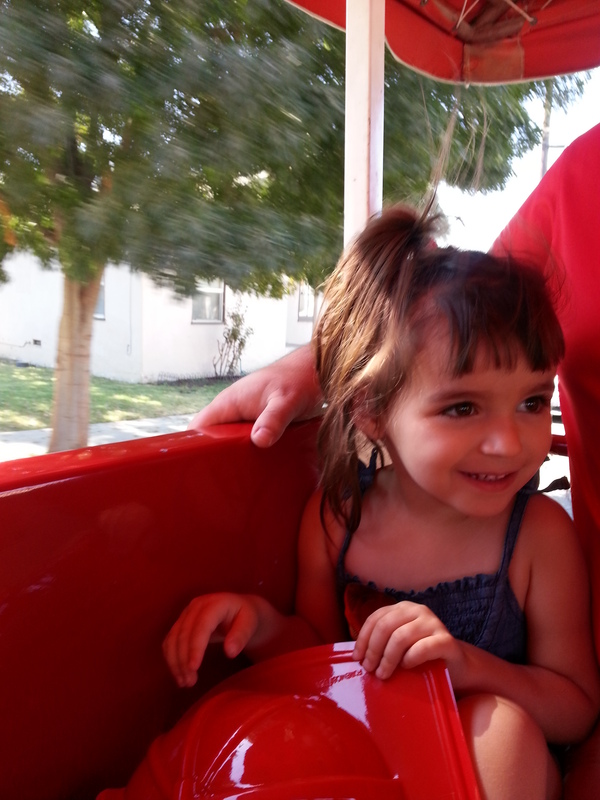 This was also the Carlos’ first time on a ride. He seemed to enjoy it as he sat down with his Dad. 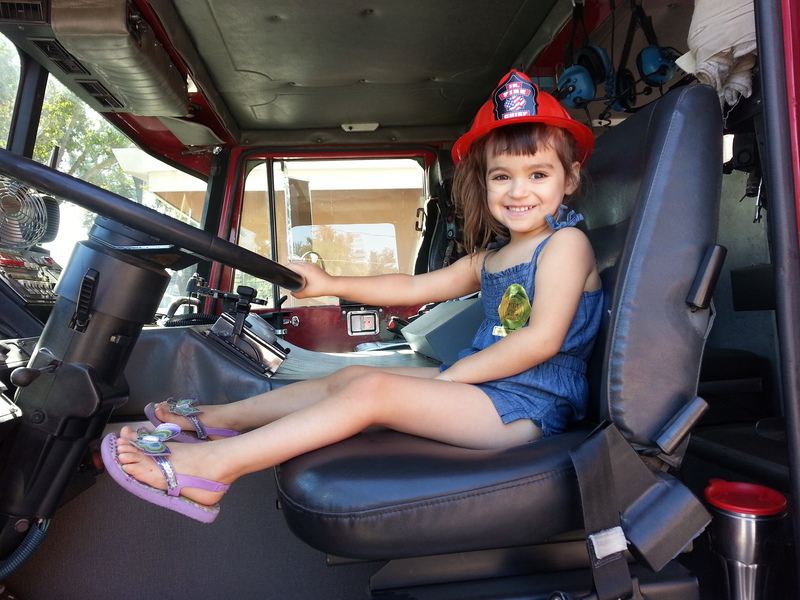 I think I will start going to Apple Hill the following week so we can make the Fire Station’s open house every year. Taking a ride through town on “Freddie”. This one came out of left field. It happened a few times, we would be playing around and instead of kissing me on the cheek or sometimes just as a surprised BAM! A lick on the side of the face! Kinda funny but I start to think … is she licking everyone? Where did she get this from? Emery often comes up with a lot of things by herself, I think this is one of them. She only seems to lick my face in a playing manner. She gets all wound up and goes for it, her dad says she sticks her tongue out a few times before she goes for it. I can’t see because I’m usually laughing or messing around not paying attention to her right before it happens. He seems to think its bond we have, where she only does it with me. Thats fine I just don’t want her licking everyone’s face. I really don’t even want it to happen to me! I get paranoid with the make up on my face making her sick. After she started that, I caught her a few times licking her fingers and touching her chalk board. I hate chalk, I don’t like to touch it, I don’t like to hear it, I really just can’t stand it. So you can imagine how I felt when I saw her licking her finger and the board. Since then I catch her all the time! Licking her arm and licking her fingers and touching things. Mostly I’m worried about her getting sick. I don’t want her to get anything because she had her fingers in her mouth or put something in her mouth she shouldn’t have. We’ve been out of the house a lot these past few weeks and her little hands have been all over everything. I clean them with a wipe, hand sanitizer and water and soap of course when I can. I don’t want to go over board and be paranoid about it. In the back of my mind I’m cautious about the things I say or how I act towards certain situations so that I don’t freak her out of make her scared of anything. For example I’m not an animal person by any means, and Emery loves all animals. She runs in the grass at night with the frogs lurking in the dark. I on the other hand will stay on the cement away from the edges, in case a creepy crawler comes my way. I pretend everything is alright but inside im screaming, “get inside the house! those ugly frogs are everywhere and I can’t help you”. Anyways I have digressed and went on an animal rant. I guess as long as I keep telling her to stop and she’s not licking animals I’ll survive this stage.